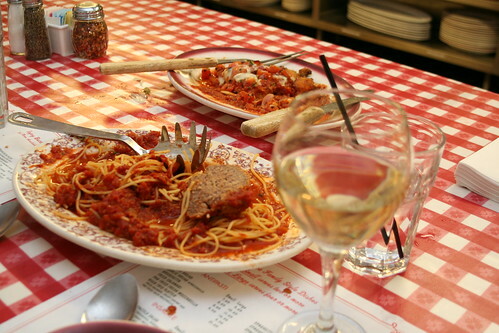 This was my last giant gluten-packed Italian dinner. This was at Buca di Beppo's in Kansas City, Missouri when my sister and I flew out to visit our Great-Grandmother and Great-Aunt. The food was fantastic, but of course I felt like I needed to be carried out of the restaurant after eating all that heavy gross food. I'm starting to really feel the difference now. I am noticing how I don't feel disgusting after I eat anymore. You know how you get so used to feeling something that you think it's just the way things are supposed to be and that it's normal? I just thought that everyone felt full and crampy and uncomfortable after eating. Now when I eat and then I don't feel anything it's kinda weird. I feel like I'm not eating enough, but I'm not actually hungry anymore. I will really need to learn how to eat intuitively. It's just strange to me to eat, feel satisfied, and then move on. No cramps. No gas. No bloating. No food coma. No lead stomach. It's pretty nice, who knew eating could be this good?? I'm pretty excited about that.